Everyone needs some serenity to help them get through the daily grind, and Random Ideas has attempted to find a way to help you achieve the inner peace you always wanted without having to give up your daily life with its new to-do app, Wasabi. 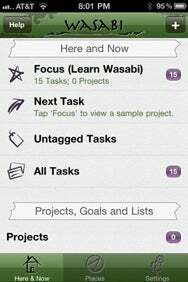 As I’m sure you know, the App Store is full of to-do list and checklist apps, but Wasabi stands out because it fully integrates with the iPhone or iPod touch and has a great deal of flexibility when it comes to organizing your tasks, projects, and goals. You can take new “to-dos” from almost any screen on the iOS device and add them to the program. Then you can organize and prioritize them by sorting them, and even transfer your lists to other devices via over-the-air syncing. You can even create “Quicklists,” smaller, quicker note for things you have to do that day as opposed to a bigger project that requires more goals or steps. This allows you to focus on the bigger picture as you go about your day. The app even alerts you to nearby locations related to your tasks. Wasabi is available on the App Store now for $5.